Following a Touch Arcade recommendation, I'm playing a little game called Postknight. It's an RPG auto-runner, almost, in which stages are filled with enemies and you have to manage special attacks, blocks and potion consumption whilst your character relentlessly marches forward to deliver mail in the next town. I was bested a couple of times in the tutorial levels. As part of a TriPo, I feel compelled to announce to y'all that I'm playing Part Time UFO, the first mobile game from HAL Labs (or, more accurately, their 'Hal Egg' division). It's a cute little thing where you play as a UFO equipped with a grabber claw, like those ones you see at the arcade, and have to take items from one place to another. So far I've stacked crates in a truck and rebuilt a small tower. You then get (in-game!) cash and medals based on how well you did. It was £4 but I'm enjoying it. I do read your posts Zero, just not got much to say as I don't play mobile games unless Nintendo ones which get their own thread. I did think after playing Old Man's Journey that would have been better played on a mobile platform or at least undocked on Switch. I was also talking about Hearthstone the other day on twitter and I watch Game Scoop where card games on mobile are brought up and I have had a go but I find the screen just to small, as I'm not going to get a tablet anytime soon it's a shame that Hearthstone has been ruled out for Switch and no card games seem to becoming anytime soon. I can think of a few others I'd like to see such as Pocket Final Fantasy XV and Monument Valley. I've got both Fire Emblem Heroes and Dissidia Final Fantasy Opera Omnia on the go. The latter is stupidly named but is actually a surprisingly reasonable mobile effort from Squeenix. There's little in the way of any energy system and I'd actually say there's less pressure to go for microtransactions than some of Nintendo's mobile offerings. I've also started the iOS port of Final Fantasy. It's... not looking great. The controls are very fiddly and the graphics were clearly designed for something with a lower resolution than my iPad as all the text and sprites look fuzzy and unclear. Couple with that with some bad encounter rates and you've got a pretty grim time. Still, it's one I've wanted to check off my list for years now, so onwards we go! As a side note, would folks be alright with this being shunted to the 3DS and Mobile subforum? Seems like a better fit for there than here. I think it shouldn't as the mobile games we would talk about in 3DS and Mobile subforum are Nintendo ones which have their own thread, where this is more for the likes of Dissidia Final Fantasy Opera Omnia. I'll review with my admin-in-arms and we'll see if anybody else chimes in before deciding what to do. I have been playing SEGA's recent free-to-play offering, and it's just as good as Crazy Taxi Gazillionaire. 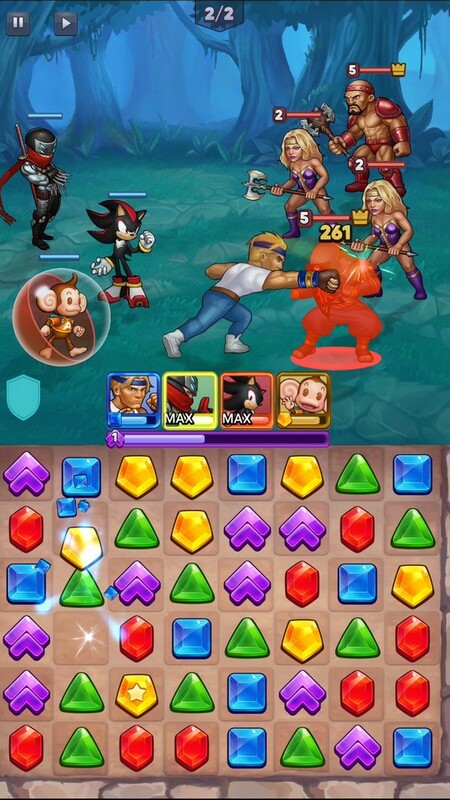 The top part of the screen is a turn-based strategy game not too different from Pokemon, whereby you have a team of four "heroes" and you must match gems (it's basically Bejeweled) on the bottom part of the screen. It is a lot like Puzzle Quest but there's that satisfying SEGA charm in the character designs, sound effects and just enough to do to keep you occupied for 20 minute bursts. Recommend giving it a go, mostly because you get to fight Death Adder against Mr. X.
Oh, I've played something exactly like that but with a Marvel spin on things. It was good fun for what boiled down to a time waster. I'd imagine having a Sega spin on proceedings would make for a good laugh too. Anyone else played any Dragalia Lost from Cygames and Nintendo? I've only done the first chapter and can see why it's been a hit but I've been bombarded with different things like upgrades, summons, weapons, castle building, dragons which seem to all use a different currency.